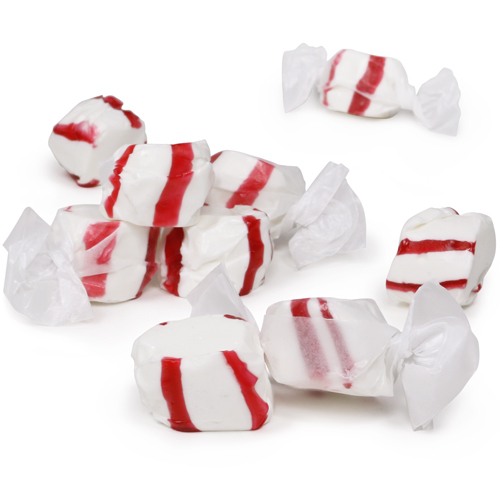 Classic taffy in fresh peppermint flavor. NOTE: In 2017, the manufacturer updated the ingredients used for this product. Please see Ingredients Information below. ALLERGENS: Contains eggs & soy. Facility manufactures peanuts & tree nuts. Ingredients: Corn syrup, sugar, coconut oil, egg whites (organic, cage free), salt, natural peppermint oil (for flavor), colored with vegetable extract (red radish), soy lecithin (an emulsifier). From the package: Manufactured in a facility that processes peanuts and tree nuts. Misc. info: Made with non-GMO ingredients. Gluten-free info: Contains no gluten ingredients. Manufacturer claims this product is gluten-free. Kosher certification: Scroll K Parve symbol is on the label on the bulk 3 lb bag only. The 1/2 lb bag does not display the Kosher symbol. Approximately 34 pieces per 1/2 pound. Approximately 210 pieces per 3 pounds. My family loves peppermint taffy. I have loved it since I was a kid. My kids have red food dye allergies so we started buying this one. 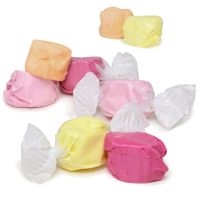 It is the BEST taffy I have ever eaten. And I have tried a lot. I have looked long and hard for natural candies. Just got my bag of these 2 days ago. Had a hard time not eating them all. Gave my picky sister some. She pronounced the amount of mint to be perfect. I'm doing an order for the 3 pound bsg. These are so good!! Love the flavor and they are soft and do not stick to your teeth! !